25 needles in various sizes. Set Bent Tip with Case 3pc- The curved tip of the needle makes hooking treads a breeze. 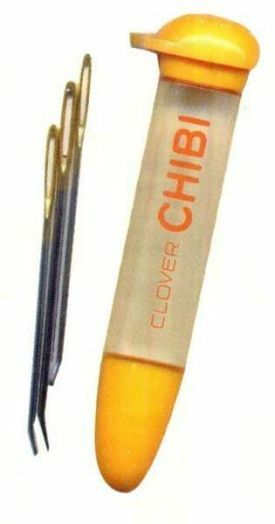 This set includes (2) #12 and (1) #15 needles and a convenient Chibi case with a screw on cap that stores needles neatly. Use with wool, thick embroidery cotton, ribbons on canvas or open-mesh fabrics. Also use in ribbon work to prevent snagging.